This photo was taken as I walked from my Grandma’s apartment in New Delhi to a nearby market. 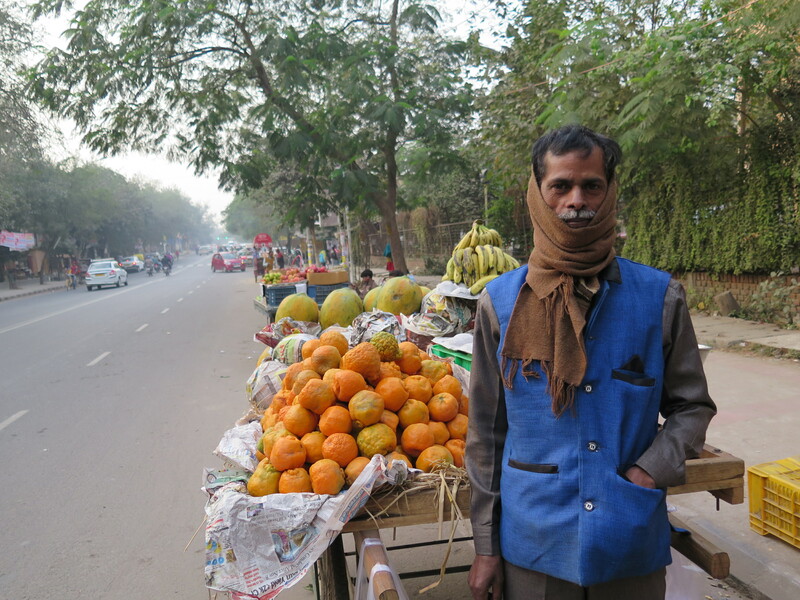 I saw this man selling many fruits and vegetables, all piled up and carefully balanced. He pushes his cart of produce outside each apartment complex and waits for people exiting the apartment to purchase his goods. My grandma mentioned how she often looks out over the balcony of her apartment, and when she sees this vendor or another one, she heads down to the street to buy food. I like the way this photo turned out because it shows what a typical city street in bustling New Delhi looks like. I also like the punchy colors of the oranges, bananas, and coconuts in the photo and how the photo captures the entrepreneurial sprit of many of the street vendors. Varun Tandon is a junior at Homestead High School in Cupertino, California. He was born in California to Indian immigrant parents and has visited India annually since his youth. The influence of these annual trips can be seen in the photography he takes. A technology enthusiast, he believes that aesthetic is as important as functionality, spurring his interest in photography and graphic design. Whether he is biking with friends, eating dinner with his relatives, or running alone, Varun always carries a camera, ready to capture the moment.